170 calories per serving. Live & active cultures (Meets National Yogurt Association criteria for live and active culture yogurt). Vitamins A & D. 99% fat free. Grade A. It is so good! Made with natural colors, flavors and sweeteners. High in calcium. Gluten free. With active yogurt cultures including L. acidophilus. 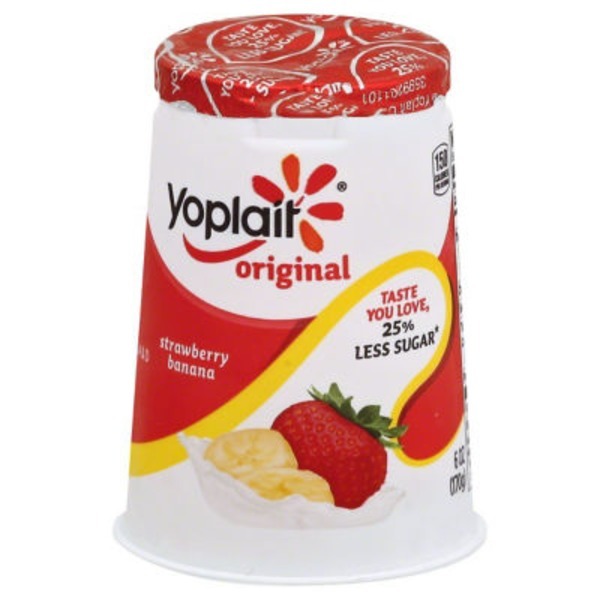 Pasteurized Grade A Reduced Fat Milk, Sugar, Strawberries, Modified Corn Starch, Banana Puree, Kosher Gelatin, Natural Flavor, Pectin, Colored with Carmine, Yogurt Cultures (L. Bulgaricus, S. Thermophilus, L. Acidophilus), Vitamin A Acetate, Vitamin D3.